BEFORE THAT, PLEASE READ THIS! New users should add two A and two B activators to the first bottle. This provides an extra-strength rinse that will help dislodge the accumulated bacteria that causes your bad breath. DO NOT USE TOOTHPASTE BEFORE USING PROFRESH® as it will decrease the effectiveness of ProFresh®. 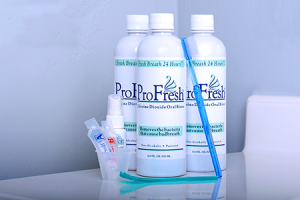 You should brush with toothpaste AFTER using ProFresh®. 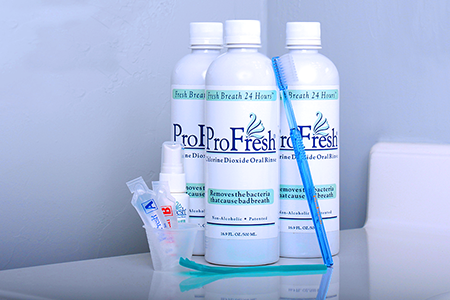 The ProFresh® system is simple, inexpensive and easy. In just 2 minutes, twice daily – this simple routine is proven to give you total relief from bad breath. Rinse vigorously with 7ml (one bottle cap) of ProFresh® Mouth Wash. Tilt your head back, extend your tongue and gargle for an additional 10 seconds to soak the back of your tongue with the rinse. Then spit out. Repeat 6-12 times, rinsing your mouth and the tongue cleaner with water each time. Be sure to clean the sides of your tongue as well as the middle to remove all the tongue coating. Rinse vigorously with 7ml (one bottle cap) of ProFresh® Mouth Wash for 20 seconds. If you don’t have time to do the 3 steps in full, simply rinse and gargle with ProFresh® twice a day and clean your tongue to loosen the bacteria. Want the Optimum in Oral Health? If you want the maximum benefit from the ProFresh® system, add the following step to your routine. With the ProFresh® rinse in your mouth, keep your head upright and insert your toothbrush into your mouth keeping your lips sealed around the toothbrush handle to avoid spillage. Brush the inside of your lips, cheeks, tongue, palate and teeth for one minute then spit out. This will help reduce the formation of plaque. Clean removable dentures daily. Rinse thoroughly with water. 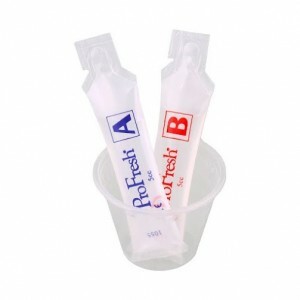 Soak the denture(s) overnight in ProFresh® rinse the first night you start the ProFresh® Programme. From then onwards, soak them in ProFresh® overnight once each month. Start your ProFresh Programme today!